"Those who give education in exchange of money, they are not brāhmaṇas. Just like we are lecturing, educated, educating people. We don't say that 'Give us salary.' We simply ask them, 'Please come.' Therefore we are making food. I'll give you food. I'll give you good seat. Please come and hear. We are not asking money, that 'First of all pay the fees. 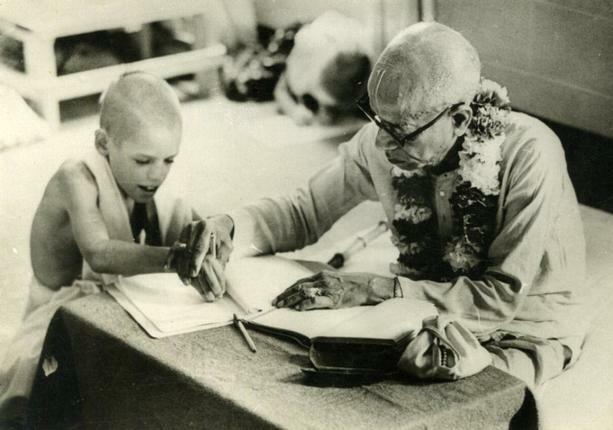 Then you come and learn Bhagavad-gita.' We never say so. So those, these so-called teachers, they first of all set up salary, 'What salary you'll give me?' That is dog's business. That is not brāhmaṇa's business. Brāhmaṇa will never ask. Brāhmaṇa is eager to give lesson only. That's all. Brāhmaṇa is eager to see that people are educated. 'Take free education and be educated. Be a human being.' This is brāhmaṇa's business. I came here not to ask for any money. But I want to give lesson. This is brāhmaṇa's business."